Many will heed the call. Few will be chosen. There are no wrong answers to any questions (be truthful). I'm seeking all types. OD&D -or- Swords & Wizardry -or- BX D&D -or- Labyrinth Lord -or- AD&D -or- OSRIC? How familiar are you with BX D&D (including BECMI but not Labyrinth Lord)? How familiar are you with Labyrinth Lord (including AEC, but not including BX or BECMI D&D)? Have you have used psionics in D&D before? Do you have a group already assembled that you plan to include on playtesting of these rules? will you be able to perform over the next few weeks? one-off adventuring, just want to run some combat scenarios)? (not including any time required to read or become familiar with the rules)? This is one of those illustrations for the Creature Compendium that I've putting putting off for a while. It's a re-do of a re-do. I think that's why I've been pushing this one off for so long. Then yesterday, while hanging at Starbucks and sipping my grandé nonfat 2 Splenda latte, I decided to abandon my original intention for the illustration and just sketch from scratch. Seems to have worked out pretty well. This leaves only 8 illustrations to finish before I feel like the book is pretty-close-to-complete. 7 of those will be easy/no-brainers. The eighth, well, it's actually a full page illustration that will feature 7 different monsters on the same page (the animal mummies). BTW, if you want the stats for the creature in the illustration below(the carriage worm), or if you just want to see the original illustration (before the first re-do), you can find them here. That leaves only 8 illustrations to finish before I feel like the book is pretty-close-to-complete. 7 of those will be easy/no-brainers. The eighth, well, it's actually a full page illustration that will feature 7 different monsters on the same page (the animal mummies). 34 years ago, I purchased my first every RPG product... what has since come to be known as "Cook Blue," though I prefer call it "Cook/Marsh Blue." This was the product that started it all for me (apart from the friend who introduced me to the concept while waiting for a Mardi Gras parade to pass earlier that year). This past year, there were a couple of key highlights during my time at the North Texas RPG Con. One of them was meeting Steve Marsh, the guy who wrote the majority of that very same book. The time he took to sit with me at the con and share his kind words about my Three Castles award-winning Valley of the Five Fires is among my fondest gaming-related memories. Partly spurred on by that encounter, and partly spurred on my long-intended want of a BX psionics system, I started the quest to do the latter in earnest a few months back. My mystic class, and the inclusion of a "Planar Primer" and "Planar Travel Guide" in my Basic Psionics Handbook, are built on a vision for a plane-traveling mystic class originally penned by Mr. Marsh, but merged with Gary Gygax's devine class by Tim Kask. "Psionics were added to D&D as the result of two character classes, the mystic and the devine, that were in process. Mystics were finished, Devines (who used the psionic attack and defense modes) were not. Tim Kask cut the material up and put it into Eldritch Wizardry." "Erol Otus mocked my idea of having the Wooly Rhinos be intelligent, so that got canned (I liked the idea of a potentially psionic group of Rhinos in the far north, coordinating the defense of the herd against predators)." Well, it only took 34 years for this vision to come to life (assuming the idea came about the year before the Expert book was published), but without further ado, I present the Steve Marsh-inspired (and Erol Otus-mocked) intelligent, psionic-using wooly rhino for the BX rules. (BTW, the "rho'tha" name was an invention of mine, but the Xhosa-inspired clicking sound in the middle was Steve's idea). This is pretty much how every psionic monster listing will appear in the Basic Psionics Handbook (normal stats to left of picture area, psionics stats right below, full description below that). Other psionic abilities (if possessed by the creature) will appear right below the Attack/Defense Modes. Sometimes, this will be a detailed listing broken out by discipline (e.g., "psychometabolic: D) body weaponry, reduction, S) complete healing"), and sometimes this will be just the number of disciplines, devotions, and devotions (e.g., "Disciplines/Devotions/Science: 2/10/3"). I have not fully finished editing all the copy on these, so please forgive any grammar mistakes/typos in the following example. Brutes are animals known mainly for their unadulterated strength. This does not necessarily mean they are lummoxes. 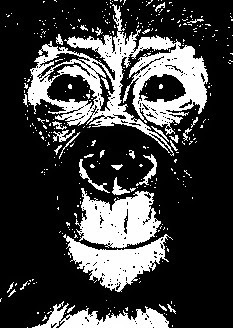 In fact, some brutes are known for their deep compassion, understanding, and even intelligence. It is their strength, however, that makes them formiddable combatants and adventurers. The intelligent and anthropomorphic variety of the animals classes that make up the brutes are generally smaller than the standard varieties of those animals. The strengths of brutes exceeds the normal human scale. Therefore, the following conversion chart is to be used when creating a brute character, based on the starting Strength score rolled (Rolled Strength Score). Brutes with a Final Strength score of 19 or above run the risk of accidentally smashing a door to pieces if the brute succeeds in forcing it open. into pieces based on a successful roll to force a door open. The prime requisite for a bear is Strength. Bears with a Final Strength score of 20 or greater will gain a +10% bonus to earned experience points. RESTRICTIONS: Bears determine their hit points using ten-sided dice (d10). They may advance to a maximum of 8th level of experience. Bears may use any type of weapon, any type of armor, and may use shields, but the costs of these items is 150% their normal cost. A bear character must have a minimum Constitution score of 9. SPECIAL ABILITIES: Bears make their attacks and save as fighters of the same level, and may use the same magic items permitted to fighters. Bears may attack bare-handed, doing 1d4 plus their Strength bonus for each hand on successful “to hit” rolls for each hand. If both hand attacks are successful, and the opponent is human-sized or smaller, the bear may choose to automatically “bear hug” its opponent for an additional 2d8 points of damage (no Strength bonus is applied to the bear hug). * In addition to Constitution adjustments. The prime requisite for a bull is Strength. Bulls with a Final Strength score of 20 or greater will gain a +10% bonus to earned experience points. RESTRICTIONS: Bulls determine their hit points using ten-sided dice (d10). They may advance to a maximum of 8th level of experience. Bulls may use any type of weapon, any type of armor, and may use shields, but the costs of these items is 150% their normal cost. A bull character must have a minimum Constitution score of 9. SPECIAL ABILITIES: Bulls make their attacks and saves as dwarves of the same level, and may use the same magic items permitted to dwarves. In lieu of making any other attack for the round, a bull may choose to charge its opponents and trample them. To do so, the bull must charge straight forward. If the bull is able to make its full movement, all creatures caught in the bull’s path (even friendly cratures) must save vs. paralysis or take 2d8 points of damage (no Strength bonus applies). If the bull cannot (or does not) take its full movement for the round, then those caught in its path only take 1d8 points of damage on the failed saving throw. The prime requisite for a rhino is Strength. Rhinos with a Final Strength score of 21 or greater will gain a +10% bonus to earned experience points. RESTRICTIONS: Rhinos determine their hit points using ten-sided dice (d10). They may advance to a maximum of 8th level of experience. Rhinos may use any type of weapon, any type of armor, and may use shields, but the costs of these items is 200% their normal cost. A rhino character must have a minimum Constitution score of 9. 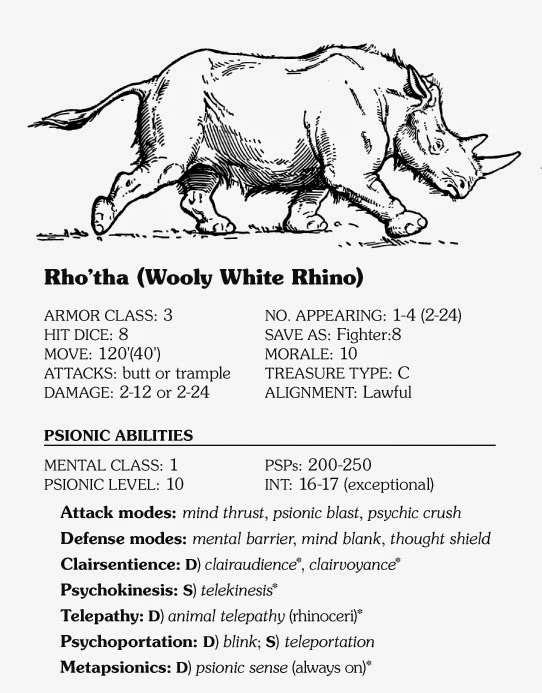 SPECIAL ABILITIES: Rhinos makes their attacks and saves as fighters of the same level, and may use the same magic items permitted to fighters. In battle, instead of using a weapon, rhinos may choose to gore at an opponent with their horn, doing 2d4 (plus any applicable bonus from Strenth) on a successful “to hit” roll. The prime requisites for an elephant are Strength and Intelligence. Elephants with a Final Strength score of 21 or greater and an Intellgence score of 13 or greater will gain a +5% bonus to earned experience points. Elephants with a Final Strength score of 21 or greater and an Intelligence score of 15 or greater will gain a +10% bonus to earned experience points. RESTRICTIONS: Elephants determine their hit points using twelve-sided dice (d10). They may advance to a maximum of 6th level of experience. Elephants may use any type of weapon, any type of armor, and may use shields, but the costs of these items is 300% their normal cost. An elephant character must have a minimum Intelligence score of 9. SPECIAL ABILITIES: Elephants makes their attacks and saves as elves of the same level, but may only use the same magic items permitted to fighters. Any elephant that attempts to force open a door that is of normal size runs the risk of becoming lodged in the doorway. If the attempt results in the elephant smashing the door, there is a like chance the elephant will become stuck in the doorway, taking 24 rounds to dislodge it, minus 3 rounds for each person assisting (to a maximum of 7 people helping, or a mimum of 1 round to dislodge the elephant). In battle, instead of using a weapon, elephants may choose to gore at an opponent with their tusks, doing 2d6 (plus any applicable bonus from Strenth) on a successful “to hit” roll. Additionally, elephants may use their trunk to make a trumpeting blare that acts as a horn of blasting. The number of times a day they may use this ability is based on their level. Finally, elephants possess an ability called “perfect recall.” This provides an elephant a chance of remember full details of an creature, small area, or thing, based on the amount of time the elephant spent studying it. A “focused study” is considered to be at least 1 uninterupted turn spent doing nothing else, a “casual study” is considered to be at least 3 rounds doing nothing else, and a “casual observance” is considered be any view of the subject, even while engaged in other activities (including combat). Any failed perfect recall roll results in the elephant remembering only general details (which may or may not be of use). Here's the updated list of monsters I will be including in BX psionics book, which I've given the new tentative title of Basic Psionics Handbook. The final page count is looking to be 52 pages, 14 of which will be just the monster listings. † FF/MM2 Creatures I originally considered dropping, but have decided to include. but for consistency sake, will appear in the psionics book with the "thresher" name. (even though the Oe/1e versions are already psionic). of the mind thresher listing. D The version currently slated for the Creature Compendium is not psionic. Mr. Marsh to get his input on the abilities I intend for them. port it over to the Creature Compendium or not. I really worked to make this take as little space as possible, and list only the truly pertinent information (in the BX spirit). If you want to see the working list of monsters I'm aiming for, check out yesterday's post. BTW, the limbo raider is going to be my attempt at an OGL githzerai. I've really tried to honor a statement Steve Marsh made in an email responding to some questions I posed him about his original intentions for the mystic class (prior to psionics inclusion in Eldritch Wizardry, "Major powers correspond to the chachras and the traditional powers so that each character had a consistent core." 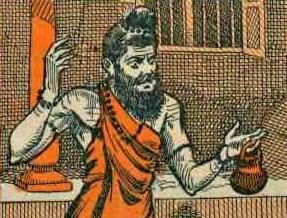 Normally, in my system, mystics may attain the first five chakras in any order, and only after attaining the first five can the sixth (third eye) chakra be known. I'm including 2 alternate systems for the acquisition of the various disciplines. The first (FIGURE A) still allows the mystic to choose any of the five basic chakras first, but (upon reaching the appropriate levels) may only learn additional disciplines which are directly connected to a discipline already known. Again, after attaining all five, he or she may then know the third eye chakra. The second alternate system (FIGURE B) is a strict adherence to "chakra building block" concept... start with the most basic (root) chakra, then "build up" from there. In this case, the 6 chakras are attained in a very strict hierarchy. a) I'm including wild psionics in an appendix. I don't really like the idea of them, but am making them available for DMs who do. b) I'm including an appendix section with general information on the 7th (crown) chakra. I see these as abilities related to attaining divinity, which makes them generally too high level for my conception of BX D&D. In general, I imagine the abilities accessed by the crown chakra will feel similar to abilities from the BECMI Immortal rules (e.g., the creation and changing of matter, energy, thought, and time). c) The mystic class, abilities listing/descriptions, and psionic combat information are coming in around 28-29 pages. With all of the intended appendix information, the book will come in between 44 and 48 pages (trying to keep it to 44, if possible). list above puts the page count to at least 44 pages. The other day, via a Google+ thread, Matthew Skail asked why I was opting for a random psionic strength point (PSP) gain with leveling, and that the other classes don't do that. 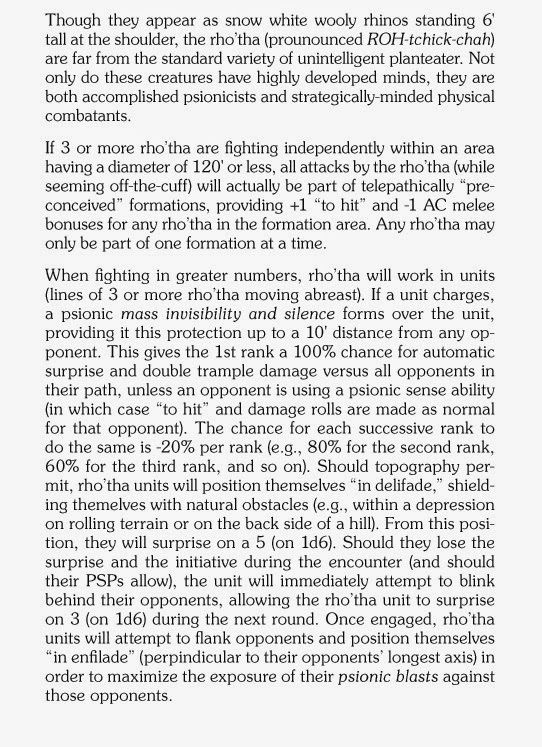 For those who haven't been keeping up with the earlier posts, I was treating PSP gain like hit dice, with the die type rolled based on the character's Wisdom score (a reminder/note that, in my system, Intelligence is the defensive psionic attribute, and Wisdom is the offensive one). Honestly, I was originally trying to capture the randomness of psionics in Oe/1e. But, upon consideration of MS's comment, I realized he's right. Thieves don't, upon reaching a new level, randomly determined their increased chance to move silently. So I went back to the drawing board... 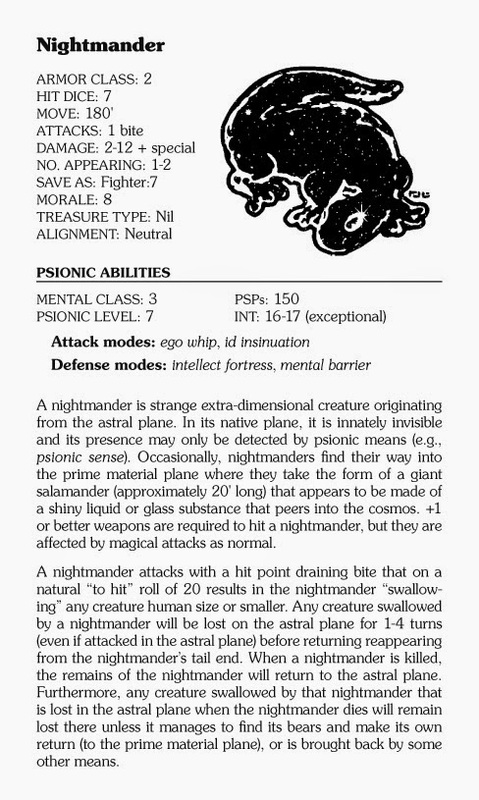 BUT, I did so with another key point in mind — I wanted to make sure that as the mystic gains levels and PSPs, the DM can easily figure out what kind/strength of psionic creatures to pit him/her against. The following chart is where I've landed. The basic formula for PSPs gained at each level is 10+(levelx2). This puts a 7th-8th level PC on relative par with a shedu (9+9 HD, 70-100 PSPs, performs at the 9th level of mastery). 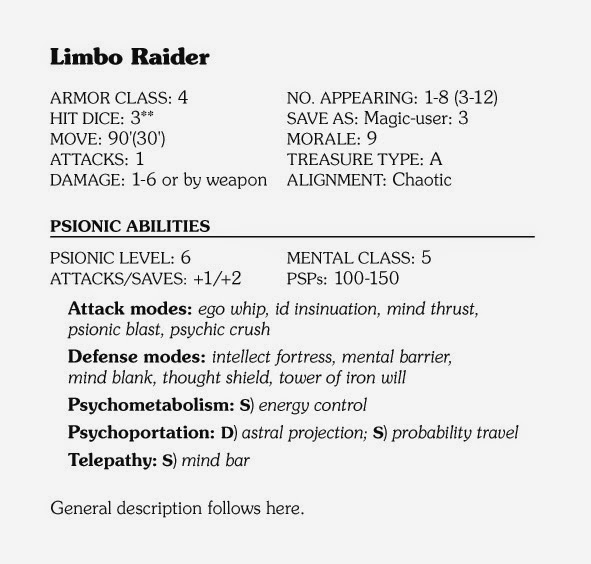 This puts an 8th or 9th level PC with a WIS of 18 on a relative par with a psionically "low-end" mind flayer (8+4 HD, 241-340 PSPs, performs at the 7th level of mastery). As always, I'm sure there will be more to come. After my post yesterday, many of you had some good questions that you shared via comments on a couple of different G+ posts. So I've decided to address them here, today, so everyone can see the answers (and the questions). I really debated this during the development of my chakra-discipline concept. My feeling was that the first six chakras coincided rather seamlessly with the 6 established psionic disciplines. I have not included the crown as of this moment, but here's my general thinking regarding the 7th (crown) chakra... the powers granted through knowledge of the 7th chakra will be part and parcel of the pathway to becoming immortal (and therefore, are not accessible by most mortal creatures). Will I ever flesh out this "immortal pathway for mystics"? Shakes Magic 8-ball... "Ask again later." For now, it will likely be a reference to the idea and concept of a 7th (crown) chakra, but without mechanics. Will it support wild psionics? They way I see it, any system will support wild psionics, because they're wild (and, therefore, outside the context of standard rules). The real question is, "Should it support wild psionics?" My simple answer to that question is, "No, because it goes against the simplicity that I love about BX D&D." To me, wild psionics are like feats and player options... if I wanted them, I'd use 2e. Now, that being said, there will likely be an appendix for determining wild psionic abilities, because I think a lot of DMs would like to include them. Besides, how much space could it take to say, "If your INT and WIS are this, and your class is this, and you roll this on table I, then roll on table II and... BAM! You've got a wild psionic power." Where does it fit, powerwise between 1st (wild and all over the place) and 2nd edition (too few points to accomplish much of anything compared to even low level casters)? This is where I think I've really hit the sweet spot... a nice balance between the two. Mystics gain abilities over time (like spellcasters), accessing different types and grades of abilities as they grow in experience level. 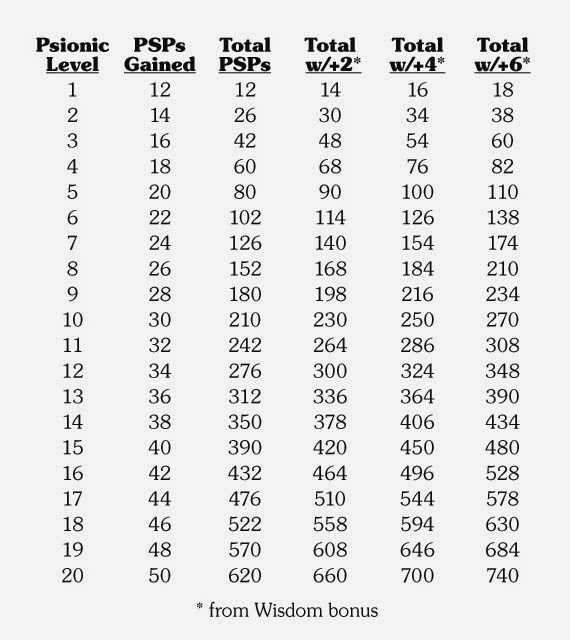 The Psionic Strength Point (PSP) cost for powers are much more "value-oriented" than 2e (meaning, the PSP costs are generally more reasonable, there are little-to-no "maintenance" costs, and the duration of many of the abilities are more akin to Oe and 1e than the terribly stripped back 2e versions). The real key to the system is the determination of PSPs, which is treated similarly to determining hit points (with the die being used determined by the mystic's WIS score)—a mechanic which is generally more liberal with PSPs than 2e, unless you have a really low WIS score (in which case you have no business choosing to be a mystic anyway). Why is Mental Class (MC) based on Intelligence rather than Wisdom? * It's worthy to note the first appearance of the Intelligence-based psionic saving throw dates to the introduction of the Mind Flayer in Strategic Review #1 in the Spring of 1975; this is approximately the same time the mystic class was suggested to EGG by Steve Marsh for the inclusion in Blackmoor; the mystic was ultimately not included in Blackmoor, and psionics was made available to "everyone" except elves in Eldritch Wizardry; I have no confirmation the INT-based save came from Mr. Marsh, and instead assume it was EGG's invention; but I will look for some clarification on this from Mr. Marsh. in the near future. How can the psionic combat system be "optional"?